Our July Fall Protection & Safety promotion is wrapping up in the upcoming weeks and we wanted to share an interesting glimpse into the time before fall protection equipment was put into use. The Empire State Building is an iconic feat of architecture, standing 102 stories tall (holding the title of world’s tallest building for 40 years!). Did you ever see pictures of how it was built? 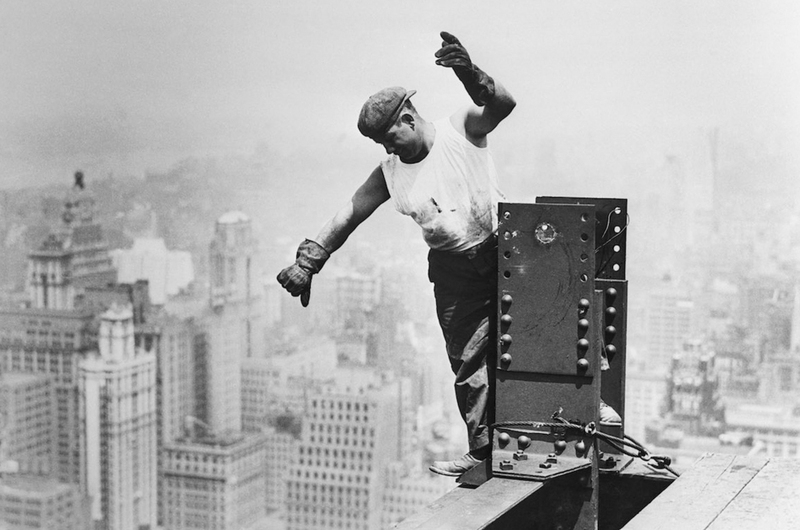 The following article presents amazing curated images of the fearless workers who built the Empire State Building in 1930s—without fall protection. Occupational safety and personal fall protection equipment has come a long way. It takes a trained eye to properly inspect fall protection. A working knowledge of the product, its purpose, and its components is crucial to make sure that nothing is missed. Harnesses, for example, have a good amount of hardware that all needs to be inspected, as well as every strap and connection point. Here is a series of videos from Capital Safety that explain the steps to take when inspecting 3 common fall protection products in our industry: harnesses, lanyards, and self-retracting lifelines (SRLs). I think it’s safe to say that we’ve all encountered and are familiar with “OSHA” and “ANSI” over the course of our careers. These two organizations have helped articulate and enact many of the accepted safety standards/regulations that maintain safe working conditions and compliance in the equipment we use, on a daily basis. OSHA and ANSI regulations affect every aspect of the entertainment industry, but do you know the difference between the two? Signed into law in 1970, The Occupational Safety and Health Act was enacted by President Richard Nixon. Its purpose was to ensure industry and manufacturing sectors possessed the most effective safety protocols, and minimize the risk faced by workers in inherently hazardous environments. One of the shows we provided staging for on the 4th of July was for the Foo Fighters at RFK Stadium. We built our biggest system, the Mountain Truss for the main stage, as well as delay towers, ADA platforms, mix positions and camera platforms. The Mountain Truss stage stood 80’ tall with 40’ wide sound wings and a 60’ turntable onstage. For the delay/spot towers, Mountain Productions built their newest delay tower design, utilizing our Mountain Truss towers. The 2 support structures were 70’ tall with 3 spot baskets integrated into each tower. This new design provides a sleek, unobtrusive tower design with impressive capacity. New York City saw its first ever 3-day country music festival with FarmBorough last weekend at Randall’s Island Park. Headlined by household country music names Dierks Bently, Brad Paisley, and Luke Bryan, the Mountain Truss stage system was built for the main stage along with delay towers, mix position and multiple VIP platforms. We spend a lot of time training with our safety gear. After all, a product is only as good as the knowledgeable person using it. From donning a harness to establishing anchor points at height, our crews are always trained for heightened awareness when it comes to safety (and if you aren’t, what are you waiting for?). Along with knowing the proper use and handling of fall protection items on site, workers also need to be aware of the dangers that occur after an incident happens, and how to quickly act. We invest a lot into fall protection systems to prevent the unthinkable, but there are always inherent dangers that come with our jobs that we can’t always avoid.